Metallic Stearate Market size was over USD 3 billion in 2017 and industry expects consumption of above 2 million tons by 2024. Metallic stearates are well-defined metal soaps of an 18-carbon chain fatty acid, identified as stearic acid. They can be used for various purpose including rubber, polymer, pharmaceuticals, food, cosmetics, paint & coatings, and construction industry. They are derived from plant or animal based fatty acid. They do not possess definite chemical compounds but contain complex blend of combined fatty acids or hydroxides. Global rubber demand is expected to grow at a rate of over 3.9% annually to reach over 30 million tons in 2019. Metallic stearates are used in rubber industry owing to their ability to avoid rubber from sticking to mold as well as to itself. The rubber industry utilizes physical and chemical properties of the product in several ways. The chemical structure consists of a stable hydrocarbon bond which is insoluble in water providing hydrophobic nature to the product boosting metallic stearate market growth. Global paper and cardboard production industry sized to surpass 400 million tons in 2014. Metallic stearates are utilized due to its melting point, hydrogen solubility and water repellence properties. They are extensively used in paper, cosmetic & stationery product industry owing to its lubricating property. It helps in preventing cracks in paper while folding. They are also utilized in making paperboard which is a major product used in packaging industry. Rising disposable income of consumers has led to increased expenditure on premium products in order to enhance their lifestyle. The U.S., Germany, UK, China, India and Japan are key consuming countries. They utilize product in construction and paints & coating as driers, biocides, catalysts, stabilizers, and bodying agents. Growing metallic stearate demand in construction industry will further propel the metallic stearate market share. Zinc stearate market is expected to cross over 6% gains in the projected timeframe. It is unsolvable in polar solvents including ether and alcohol but soluble in benzene and chlorinated hydrocarbons when heated. The product is widely utilized as a release agent for manufacturing rubber, powder metallurgy and polymers owing to its non-stick property. In cosmetic industry, it is used as thickening and lubricating agent used to improve texture of products hence propelling product demand. Magnesium stearate industry size is anticipated to witness gains at over 3.5% by 2024. It is a white, water-insoluble powder in nature. The product is utilized owing to its softness, insolubility in several solvents, and low toxicity. It finds application in the production of pharmaceutical drugs and cosmetics products as a release agent and as a lubricant owing to its property of preventing elements from sticking to manufacturing apparatus. Aluminium stearate market size from food applications will surpass USD 30 million during projected timeframe owing to changing consumer demand for organic food products. Global food flavouring market expects gains at over 5.5% in projected timeframe. Acceptance from FDA and GRAS for utilization of these stearates as direct food substance would further increase metallic stearate market share. 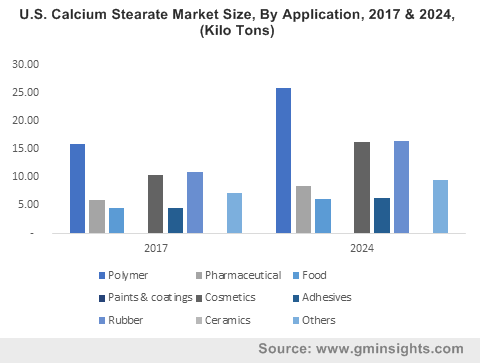 Calcium stearate market size from personal care & cosmetic application will witness 6% gains over the projected timeframe. Global organic cosmetic market was valued at over 13 billion in 2017 and is anticipated to grow at 6.5%. The product is used in cosmetic products including creams, lotions, ointments, and shampoos owing to its lubricating qualities. Shifting preference for organic face powders, eyeshadows, and lip colours would propel product demand. Asia Pacific, driven by Japan, India and China metallic stearate market size, is projected to surpass USD 1.5 billion in the estimated timeframe owing to its growing application in construction industry for its hydrophobic agent in mortar and plasters. New opportunities in residential, industrial and commercial infrastructure will increase utilization of the product hence propelling its regional market growth. North America, led by Mexico, Canada and U.S. metallic stearate market, may observe significant gains up to 4.5% by 2024. Increasing food innovations utilizing the product owing to consumer inclination for organic food product. Sugar free confectionery products are gaining popularity in the region owing to growing health concerns, rising obesity issues, and recent increase in diabetic population thus fueling regional product demand. Europe, driven by Germany, UK, and France metallic stearate industry size, should witness significant gains of 5% over the projected timeframe. Presence of numerous cosmetics and personal care manufacturing companies in the region along with rising consumer preference for organic cosmetic products will drive the product demand. These products are used in deodorants, bathing shower gels, along with oral care products thus increasing product demand. Global metallic stearate market share is highly competitive and moderately consolidated with key industry participants including Valtris, Dover, Faci, James M. Brown, and Lumega Industries. Companies are investing heavily in R&D activities to innovate new products, seize higher market share and retain their existing customer base. 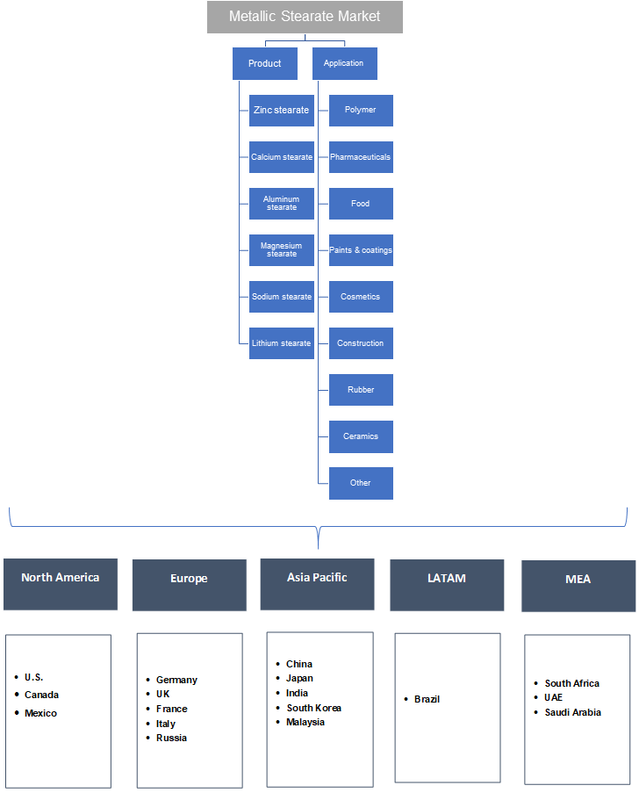 Manufacturers are expanding their regional presence in Asia Pacific region to easily source raw material and for availability of cheap labour. Companies are concentrating on offering tailored solutions to their consumers to ease their requirements. Companies also device long term contracts with manufacturers to avail consistent supply for raw materials. Metallic stearate are amalgams of long-chain fatty acids with metals of different valencies. It is made through metal soaps mixed with stearic acid. Various types of products available are zinc, aluminium, magnesium, sodium, calcium and lithium. They prevent solid washing detergents and powders from water absorption. It is also used as mold release and anti-caking agents to different types of fillers to improve water resistance.